I have written a little about my pattern of the day calendar. I made the eyelet rib fingerless mitts adapting one of the patterns. The other day there was a colorwork pattern called “American Gothic”. 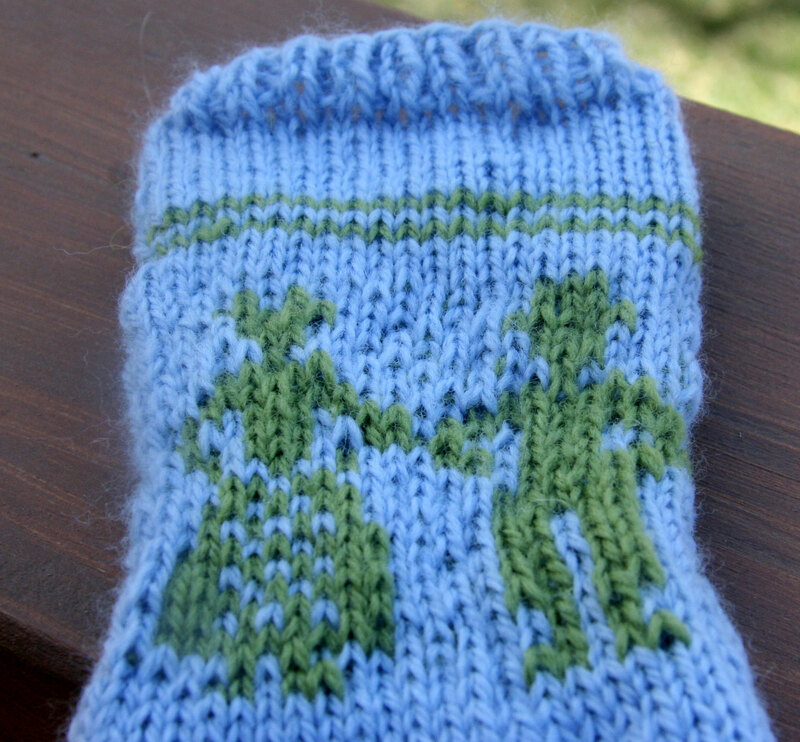 I really liked (like) it, and I thought it could be great on some fingerless mitts. So I tried it out. It did knit up nice. However, I thought I would just carry both strands all the way around the mitts. I weave them in as I go and it makes for a very tidy look which I thought might also add extra warmth. It was a nice idea in theory, but I didn’t allow for the tension problems. I cast on only a few extra stitches when I should have cast on probably at least 10-15 to allow for the increased tension of the colorwork. It is an idea that needs work. I like the little guys. Here’s a photo – although ideally I need to block it so the knitting evens up. So that was fun but the mitt is very small. It fits Davey almost perfectly, but American Gothic just doesn’t seem like a pattern meant for toddlers. Speaking of toddlers (my transition to superheroes), Davey loves superheroes. We checked out a preschool Superman book the other day. We read it every day. Davey loves Superman. He loves to spread his superheroes out all around him. He has found a great spot in our bedroom where he really has some room to move his guys around. I think he looks like he is about to cry in this picture, but I don’t think that he was. 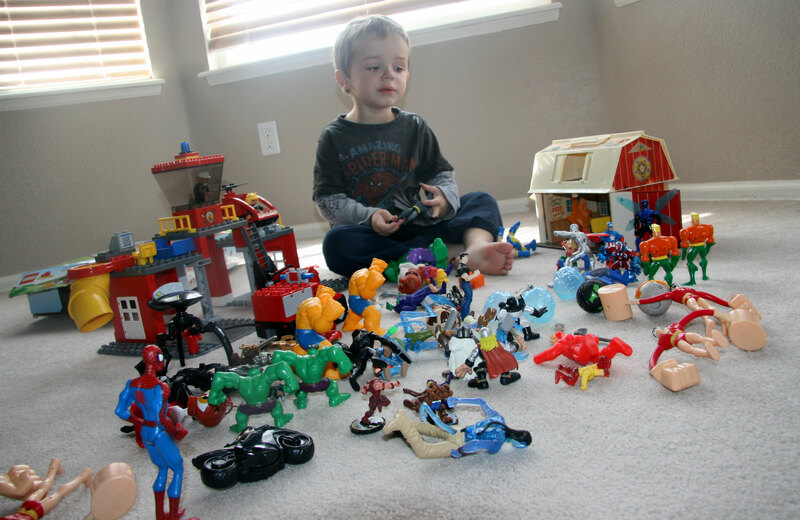 He plays with all these little guys and says, “Daddy. Is this a good guy? Is this a good guy?” He has many questions. Yesterday we were out on the front porch and a car drove by. As it passed, Davey said, “Mommy, I think there was a supervillain in that car.” By this time the car was at the end of the street, so I am not sure which supervillain it was that he thought was in the car. David suggested it might have been a balding man – so Lex Luthor maybe? It’s hard to get the tension right with colorwork. I could see that pattern circling a sweater. What a cute pattern, you could use that for lots of things. I’m glad you have Davey on the lookout — wouldn’t want any supervillains taking over the neighborhood. Nice to meet you! Thanks for stopping by today. I am quite impressed with your knitting skills. I don’t personally know anyone who can knit or crochet. That’s sad! I think I once learned some basic knitting stitches back when I was in Brownies. Now that was a long time ago. 🙂 Your little boy is very handsome! American Gothic and little boys together crack me up! Your knitting skills are being wasted in Colorado–don’t you want to visit Arkansas???! !